The top and door are made of 10-gauge steel; the rest is made of 12-gauge steel. The round cylinder is a rolled piece of steel, not a barrel or piece of pipe. All joints are completely welded, all corners are rounded, and rough or sharp edges are ground smooth. Every part of the Cylinder Stove and its accessories are designed to be easy to use, yet strong enough to last and not break down with time. 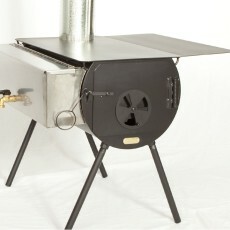 Warp Free Design – The top of the stove has braces welded underneath to keep the cooking surface flat. The door has a square frame welded to the inside to keep it flat and insure a tight seal against the stove. The round cylinder allows the stove to expand and contract uniformly, virtually eliminating any warping in the body of the stove. Ashes settle to the bottom of the round cylinder, keeping heat off the tent floor and preventing stove burnout. Efficient – being all welded, the stove is air tight, which allows you to precisely regulate the rate of burn. You can stoke the stove full of wood at night and shut the damper down and get a nice even burn overnight, instead of roasting for a couple of hours and then freezing until morning. 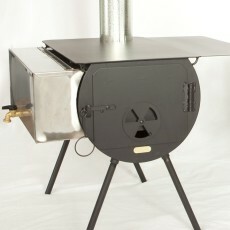 Cylinder Yukon Stove is large enough to heat those really big tents. It uses the Outfitter’s accessories. 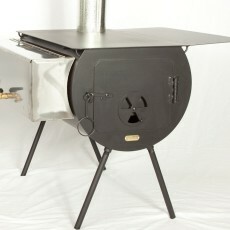 This stove is 28″ L x 18″ W x 14-1/2″ H, 25″ Tall with Legs. 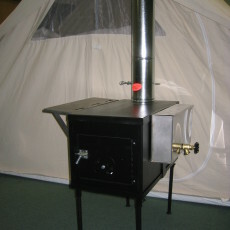 The Cylinder Yukon Stove works well in tents that are 16×20 or larger. It will hold heat for 10-12 hours.